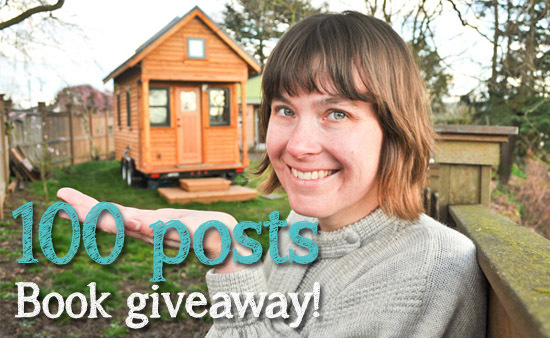 In the spirit of blogging and minimalism I'm having a little ol' giveaway to mark 100 posts. Just a little less was first inspired by reading minimalist blogs (mainly American) and one of my favourites is Rowdy Kittens. Here Tammy Strobel writes about her and her husband Logan's path to minimalism from a normal middle-class lifestyle to tiny house living in Northern California. Her photos, honest reflections on life and helpful advice are always inspiring. Whilst her lifestyle is radical so much can be learnt from her story and can be applied to simplifying your own life at any level. 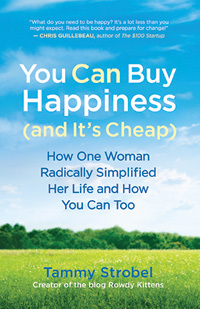 Tammy's book You Can Buy Happiness (and It's Cheap) was published in September 2012 (just as I started writing my blog). This book is a brilliant guide to help you simplify your life and seek happiness from non-consumerist sources. She deals with important subjects such as possessions, time management, relationships and work and suggests micro-actions at the end of each chapter to prompt you to make changes. I would like to give my copy of this book away to one lucky reader to thank you all for reading my blog over the last 100 posts and almost 100 days. I am happy to post the prize worldwide and entries will close on Tuesday 15th January. The winner will be picked by random and will be announced here on my blog on Wednesday 16th January. To enter just leave a comment below and be a follower of Just a little less. If you would also like to include in your comment what happiness means to you that would be fab. Good luck and in the meantime please check out Rowdy Kittens. Thanks Tammy for inspiring me to write a minimalist blog for the UK. I love her blog, so inspiring. Count me in. !00 posts, how lovely, I do love a milestone!! That book sounds just up my street, count me in. Happiness is something I'm trying to locate at the moment. Having been somewhat unsatisfied with my life for the whole autumn I'm currently trying to find out how to locate happiness in this life here and now, not dreaming about travel, future and "when I..." constantly. Tammy's photography is amazing, and I'm so impressed with their ability to live in such a small house. Count me in for the giveaway. WOW I think this is a brilliant giveaway please count me in! Could I join in too? Just beginning to see how a less consumer focussed lifestyle would make me happier so this book is just what I need. Happiness today was - decluttering my wardrobe. How lovely! I too have visited her blog over the years. But I haven't read her book. If my number is drawn, I would love to read it and then pass it on for someone else to read afterwards. Congratulations Claire on your one hundredth post! Having read them all I can honestly say they have been an inspiration to me and I look forward to many more. Now that I'm no longer "Anonymous" and have decided to subscribe rather than check your website daily I hope I'll be eligible to go into the draw for Tammy's book. As I recently commented, we are putting our house up for sale in a week's time with a view to downsizing so the book would be appropriate! What makes me happy is being on the minimalist path and finding other like souls the whole world over with whom to share the journey. Hello Penelope and welcome. Good luck with the giveaway! Please count me in to your give away and congratulations on your 100 posts. I am happy when I have the time to stop and appreciate all the good things around me. Also found you via Lynn, like Angela! We have downsized radically, coming back from a large house and garden in France to a much smaller place here. Please enter me in your giveaway, I'm just going to follow you...now. Well done on your 100 posts! I'm always amazed at the fact that you post something every single day! Please enter me in your giveaway - I've only just started on my decluttering/living-with-less journey last year, so the book would come in very handy. Congrats on 100 posts! And I would love to have a copy of this book to help me get happy! Hi, count me in! Just found your blog, look forward to discovering it! Celebrating the little things makes me happy, and realizing how fortunate I really am. congrats on your 100 posts. would love to enter your contest. I've just found your blog and become a follower. Thanks for following. Good luck - will be drawing the winner after work today.